I had the double intention of taking some pictures of the baptismal font, as an upcoming theme for my Project 52 group is Water. I spent the first little while sitting on the floor by the font playing with the holy water. Marinating in holy water HAS to be good for you, right? 🙂 And the floor was nice and cool — I loved it. Next, I took a “video tour” of the upper floor of the church. I’ll see if I can get the video uploaded somewhere soon (sometimes I have an issue with file size, but don’t do enough video work to warrant getting a professional account somewhere). Of course, this started out with taking pictures of everything, as that is what I do. 🙂 And, yes, I took over 100 pictures…. LOL! I still had about half an hour until I wanted to leave, so I pulled a book out of my backpack and sat back down by the font to read. A little while later a woman walking down the hall asked, “Is there anywhere in this church where you can light a candle?” Since I had seen it on my video tour, I replied, “Yeah, it’s down the hall by the Mary icon,” pointing. I kind of watched while she walked down the hall, and it looked like she was getting lost in the seating area. I called after her, “It’s all the way at the end of the hall!” Then, I got up, hopped over the river of holy water and went over to her. 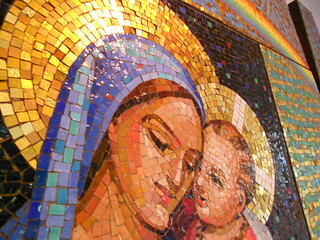 As I started to walk her down to the mosaic of Mary and Jesus, I noticed that she seemed a little upset. I asked her if there was anything wrong, if there was anything that I could pray for, for her. She started crying and told me that she had lost her house. Not only that, but she was a nurse, currently out of work, and had been staying with a friend until recently. Her friend had told her sister that it wasn’t working out, so she not only felt abandoned — because she was no longer welcome there and had no place to go — but she felt additionally hurt that her friend couldn’t tell this to her directly, but spoke to her sister. She was getting a little disillusioned, starting to question where God was in all this and becoming weary of her burden. I gave her a hug and asked her if she wanted me to pray with her right there, in front of Mary. She said yes, so I lit a candle for her, and we both knelt down. She asked if I would pray, so I prayed aloud for all of her needs. She wept. She said how happy she was that I was there, that she had asked me a question, and that God had brought the two of us together. After we prayed, we started to walk back down the hallway. She let me know that she was there to meet with some people from the Knights of Columbus and that they had been putting her up in a local hotel. She said that she had spoken to Fr. John and that he had put her in contact with the Knights. She said that he seemed like a nice man, and that she hadn’t known that he was in charge of the radio station. We talked a little about the radio station and she asked when his show came on. I said I could look it up for her and we walked over to where my phone was. On the way, she noted that she had given Fr. John 3 Miraculous medals. I stopped and kind of looked at her for a second. A couple weeks ago, I was feeling particularly bad and had been spending lots of time after work at the church. On one of the days, I ran into Fr. John while I was there. He asked if I had a Miraculous medal. I did not. He said that a woman gave 3 to him and he had been praying about who to give them to. “He gave one of them to me.” She looked at me, “You’re kidding!” She asked me a little of how I knew him. I didn’t share a lot, but did agree with her that it was good to pray for him, as he tends to keep himself pretty busy. 🙂 I sat down to write down the times that his radio program, “Christ is the Answer,” aired, and she went to get her soda and said she would sit down apart from me, so as not to “bother me” any longer. She didn’t realize that I was writing down the show times for her. Please join me in praying for her. Next Oh No He Didn’t!